IES Intelligence for Environment & Security – IES Solutions (IES) is an Italian SME, based in Roma and Catania. As the company name suggests, IES is operating on the market of services and technologies for the Environment and for the Safety/Security domains. IES has a proven expertise in turning ICT research into innovative solutions, particularly for environmental and emergency management. The experience as Project manager of the REACT (Emergency Call Management), LOCCATEC project (earthquakes), REACH112 (Emergency Services for Deaf and Hard-of-Hearing people using Total Conversation) and Communication experts in OSIRIS (floods), RESCUER (explosives) VIEWFINDER (chemical accidents) has built a significant background in evaluating the impact of ICT solutions in emergency services domain. Remarkably, the experience gained in such projects has allowed IES to guide the adoption of an XML data format later adopted by the Italian Ministry of Interiors (Dept. of Fire Services) as national standard for exchanging data and ensuring interoperability between Control Rooms (the Common Alerting Protocol). Secure interoperability tools exploiting this protocol have been provided to the Italian Dept. of Fire Services with customisations and extensions to other emergency services. Further to the earthquake in Abruzzo Region (April 2009), the bespoken tools (currently marketed with the brand name JIXEL – www.jixel.eu) have also been extended to the monitoring of cultural heritage assessment, to the management of the so-called “Fire Season” in Calabria Region (June-September 2009 and 2010) and to the management of emergency calls generated by deaf people. More recently, JIXEL has been used during the management of the aftermath of the earthquake in Emilia Romagna (2012). IES has been involved in two projects (SARFIRE, funded by ASI [Italian Space Agency] and MOSBASE, funded by FILAS Lazio Region) aimed at exploiting Remote Sensing Data combined with ground truth collected by the user for improving forest fire management. 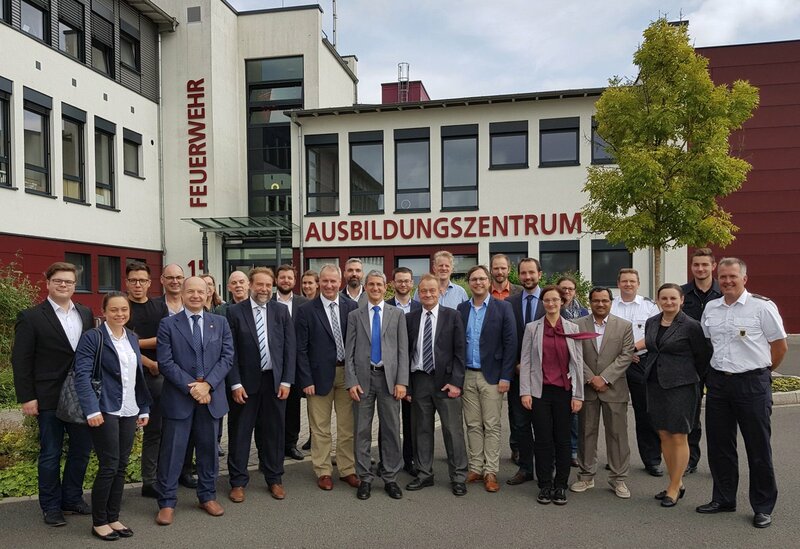 IES is currently the Technical Coordinator of the FP7-SEC project IDIRA (Interoperability of data and procedures in large-scale multinational disaster response actions) and Project Manager of the FP7- SEC Support Action ESENet (Emergency Services Europe Network). Design, development and integration of new applications and modules for the social media and of new methods for getting access to crisis related data. Development of the applications used by individuals for alerting others and Emergency services, and of the interfaces between the EmerGent platform and the citizens. IES has developed APPs for smartphones that make use of integration with the Social Media world, with particular emphasis to the emergency sector. Amongst them, 115-4-deaf was targeted at providing the deaf community a way to interact with emergency services using an APP. For what concerns specifically the social media world IES has developed tools for interacting with social media data sources, using API and interaction especially for Twitter. 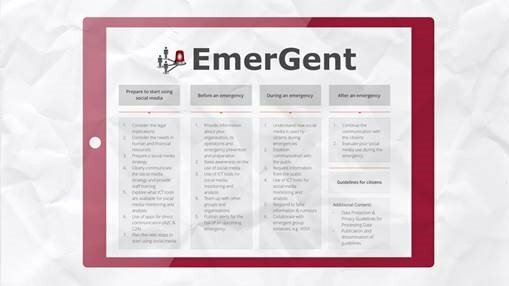 In EmerGent IES designs, develops and integrates new applications and modules for the social media and new ways to get access to crisis related data. IES is responsible for WP6 (Novel Emergency Management in Social Media Generation), being the main developer of the applications used by individuals for alerting others and Emergency services, as well as taking care of the interfaces between the EmerGent platform and citizens. Moreover, IES offers their EDXL-based platform (JIXEL) as a working tool for the sharing of information between Emergency services. The networking activities IES is currently carrying on with Emergency Management Services and Standardisation Groups will be the driver of the activities in WP7 (Guidelines, Dissemination, Exploitation and Ethics), where IES contributes. In addition to the work on WP6 and WP7, IES provides contributions to the Project Management (WP1) as required, and contributes to WP2 (Impact of Social Media in Emergencies) for assessing the impact of social media in emergencies on Emergency Management Services and Citizens, also supporting the continuous involvement of citizens into the research (by means of an active presence on social media and of the participation to the project workshops with experts). IES also works in WP3 (Analysis of Social Media in Emergencies Today and Tomorrow) contributing to the analysis of processes, tools and interfaces and to the identification of the requirements for the EmerGent solution. IES also works in WP4 (Information Mining and Information Quality) supporting the development of a common semantic data model and Information mining methods, and contributing to the design, implementation and verification of Information Mining and Information Quality components. In WP5 (Information Collection and Presentation), IES has a leading role in designing, implementing and verifying software components and apps for Emergency Services and Citizens to be integrated in EmerGent. All the activities on design, development and verification tasks are grounded on the experience gained by IES in both previous funded projects and on the long experience in developing and supplying software tools to Emergency Services.